The new RICOH Ri 100 is a Direct to Garment (DTG) printer for anyone, anywhere. 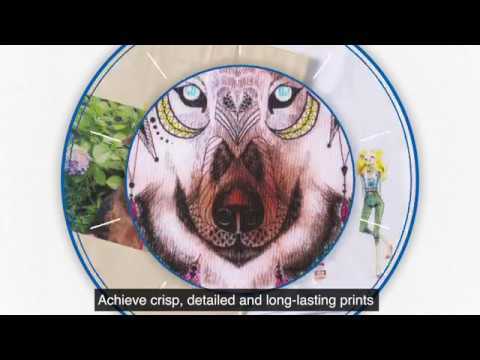 It prints designs and photographs directly onto garments using state-of-the-art inkjet technology. The RICOH Ri 100 enables you to print a wide range of long-lasting products, whether you are a beginner or an experienced print service provider. It has never been easier to print a one-of-a-kind T-shirt or bag for your customers to take away immediately. The RICOH Ri 100 invigorates the world of Direct to Garment (DTG) printing with its space-saving design and enables you to expand your business with one Direct to Garment printer. With a low initial investment, Ricoh provides a complete solution for Direct to Garment printing that includes printer and optional heating system. With a fast ROI and an easy-to-use design, the RICOH Ri 100 provides you with the convenience of having your equipment in-house with the ability to print on-demand and offer personalised garments via a simple print workflow. You can flexibly respond to the changing needs of your customers and deliver high-quality promotional and personalised garments quickly and without the constraints of minimum order quantities. It has never been easier to expand the scope of your business and secure extra added value from print services from one easy-to-use device. You can provide innovative printed garments such as photo gifts and souvenirs to attract new types of customers across a wide range of substrates such as t-shirts, tote bags and sweatshirts – the only limit is your imagination.